Lego gold mine - bubble top indicator? "Dig for gold deep inside the busy mine! The Mine is a busy place, full of miners digging for gold! Break up the rock with the big drilling machine and transport it out of the mine with the train. Then load it onto the conveyer belt with the crane and haul it away with the truck! There's even a safe to keep the gold inside. Help the miners find even more gold by blasting with the dynamite! Includes 4 minifigures: crew chief, crane driver, driller and truck driver. Accessories includes 3 dynamite packs, (1 with a timer), 2 detonators, 2 rocks each containing 6 gold nuggets, 36 small rocks in a selection of colors, 2 gold bars, explosion warning sign, storage box, jackhammer, fence with hazard lights, wheelbarrow, broom, shovel, pickaxe, walkie-talkie and coffee cup." "I believe people should take the risk in their career and not take risks with their money." If you are young, "I would say for you, invest your money conservatively and go out and try different jobs. Try to start a company, try to start your own business, try that crazy idea that all the experts say will never work, try to build these things, take your risks in your career because you’re young enough and you can recover from that experience. This is a lot opposite from investment books. A lot of investment books encourage a lot of risk-taking in stocks when you’re young. But the thing is, if the bet doesn’t work, your savings are not going to grow." "I tell people to be conservative with their money and take risks in their career and try to build wealth that way. And if they don’t want to take risk in their career I understand that too. There are people who don’t want to, but at the same time don’t assume you can replace your money. I think most people will be better served with a stable portfolio that’s not swinging in value because when it starts swinging in value, your emotions are going to get in the way and you’re going to make bad decisions." and "designed to weather a wide range of economic conditions (prosperity, inflation, deflation, recession) to protect and grow your money." Who's to argue with the eggheads at the BIS? Well, a lot of financial market people who hate gold always call it a commodity, which hides its special nature. Any commodity with around 60 years of above ground inventory would have a price close to zero. The fact that gold has a price tells you it is not a commodity. 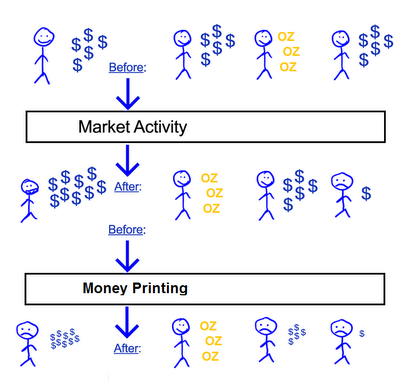 I think Warren's market flowchart needed to be refined. Been a busy boy this week, click here for my interview with Kerry Lutz. Starts off with questions about the Perth Mint and the Certificate Program, but he hits me up with a question on price maniplation at the end where I distinguish between manipulation and supression. Also, a very good post by Warren at Screwtapefiles blog on his favourite topic of social media manipulation in the precious metals space. 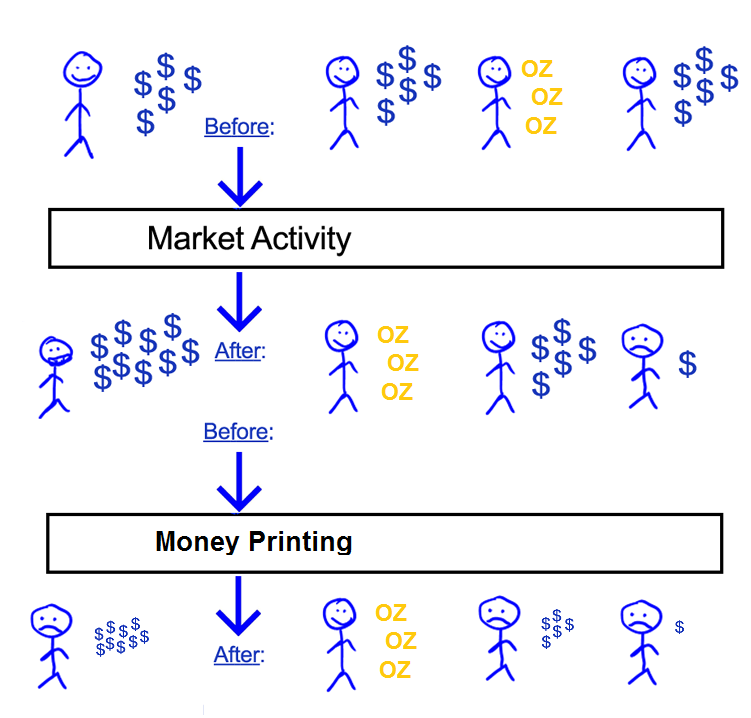 His chart on flowchart of how the metals market works is also a classic. Inspired by a chart Ed Steer posted on silver's seasonality, I decided to have a deeper look at it. I was looking for a strong pattern and considered many different time periods but just couldn't find anything reliable enough. I think silver is just too inherently volatile and driven by differing globally dispersed demand drivers to exhibit any consistent seasonality. Article can be download from here. Stupidest PM statement of the year? Jeffrey Lewis: "One of the main advantages of buying silver versus more costly precious metals like gold and platinum is that silver’s relative cheapness allows you to buy more metal for the money." How does this make any sense as an investment rationale - buy it because you get more "stuff" to look at? On that basis copper is even better than silver. I challenge anyone to find something more nonesensical or WTF (conspriacy theories excluded) in the precious metal blogosphere. I was interviewed by Erik Townsend for Financial Sense on The Role of Arbitrage in Precious Metals Markets. Probably stuff readers of this blog already know, but if you want to hear me ramble on, download the podcast. Have been involved in a bit of a non-debate (as in the other side doesn't want to explain their position) on whether traders can just rely on data from COMEX. My answer is no, as the COMEX precious metal markets are but one part of the total market for paper and physical metal and through arbitrage are tightly linked to each other. Therefore just relying on COMEX open interest, volume, etc data will give one an incomplete view and thus trading methods based only on COMEX analysis will produce a lot of "surprise" events/patterns. I covered this point in this post on short term trading. To observe me banging my head against a brick wall, and for a further exposition of this view, read the comments posted at Scott Pluschau's blog. During my recent trip to New York I did a short interview with The Street, see here. Was over there for the Euro Pacific Capital Global Investment Conference. Peter Schiff did about an hour talk at the start, pretty much covering the stuff in his new book The Real Crash, all without notes. Got a chance for a short chat with him but forgot to get him to sign the book. Doh. Also managed to catch up with a few Depository clients. Always good to get feedback and I got a few tough questions thrown at me as well. I haven't met a client I don't get along with, I think its because us gold holders all have the same concerns, values and outlook on how economic life should be organised (or should I say not organised).